You are looking at the oldest plant remains scientists have ever found. These are spores (cryptospores to be precise) which are no bigger than 40 µm (micrometers) from at least five different species including an unknown one (h). They dated the rocks containing them and found their age to be 471 to 473 millions of years old! Although none of the species that produced these spores are alive today, their descendants still are however. They form a clade of primitive plants, the Liverworts, of which you can see an example below. These are somewhat representative of the earliest land plants, as they do not have true roots systems for example. The scientists that made the discovery argued that the fact that they found diversity among the first land plants at such an early date might point to the fact that they had colonised land even earlier. The current location of these finding also gives a clue as to where this colonisation has occured. 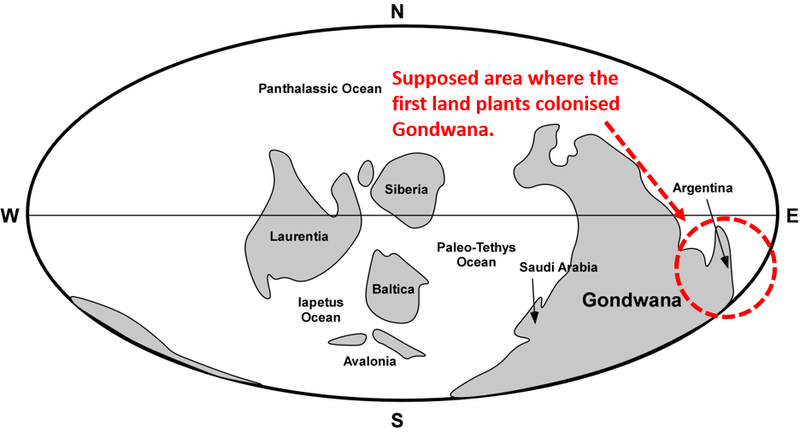 The authors have estimated that the colonisation must have taken somewhere on the east coast of the super-continent Gondwana, as you can see on the map below. Adrien for Sci&Fi, over and out.